Globally-inspired and made locally in Vancouver, BC, Quesava makes it easy to #feedyourtribe with delicious and nutritious veggie-based baked goods that are free from gluten, GMOs, additives, preservatives, trans-fats and refined sugars. All their food begins with simple, wholesome ingredients and the true star: vitamin and mineral-rich cassava root. I boiled the sweet potato vegan ravioli and cheddar-style vegan perogies in the same pot of salted water, then swirled them around in a hot pan of oil and herbs to get that essential outer crispiness before plating. The perogie triangles tasted exactly like a regular dairy-stuffed perogie. Cheesy, crunchy and chewy with a touch of spice, they were the definition of bite-size bliss. The ravioli wasn’t overly sweet potato-flavoured; the cilantro and jalapeno came through beautifully along with the dynamite texture combination of chewy and crispy. The winner for me though was the green pea and potato samosas. First off, all you have to do is slide them in the oven, flip once, then serve. I swear as more years tick off my life, my resentment at making dinner every night pulses a little harder. What a dumb time for a meal that is supposed to be so significant. Everyone is tired, impatient and hangry. With the pre-heating they were ready in 20 minutes so I was already stoked, but oh my, they are also terrifically tasty! The insides are delicately spiced and the outside echoed the other dishes in the meal - crunchy and light and crispy. Next time I will serve them with a mild chutney and flash fried green beans. Look at me inspired to meal plan! It’s a Christmas… no, it’s a Quesava miracle! I highly recommend grabbing a box of each and creating a similar-style feast to feed your tribe this week. 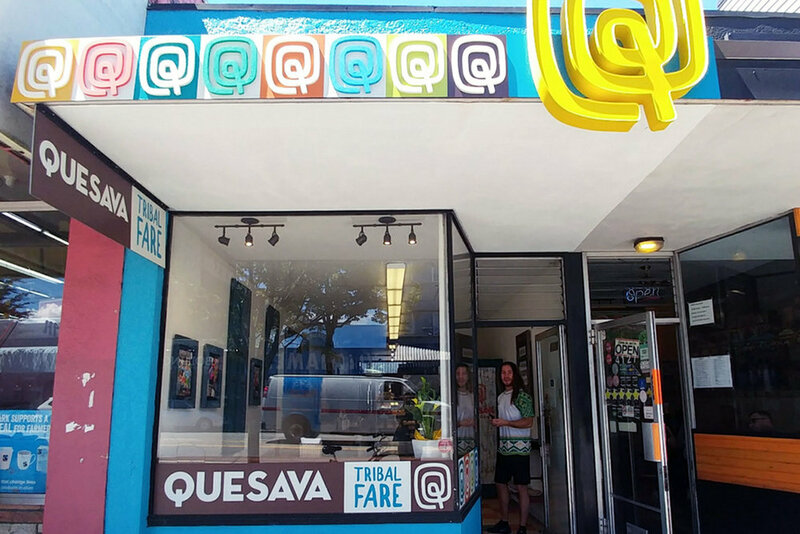 You can pick up fresh and frozen Quesava products at their shop on Main Street and at select grocers. See their website for their full line of products and where to find them. You can also find Quesava on Twitter, Instagram & Facebook. The soundtrack to this column is ‘Soul Run’ by Tanika Charles - featured on the Spring 2019 Planter’s Guide Playlist - download and listen on Spotify here. * Disclaimer: Quesava graciously provided a selection of items for The Planter’s Guide to sample, but all opinions expressed are my own.